According to GIA grading reports, the princess cut is a square or rectangular shape and the princess cut engagement ring is designed to enhance the sparkling effect of the diamond. While buying Princess cut diamond engagement rings, make sure that the setting protects the four pointed corners as these corners can be prone to chipping. 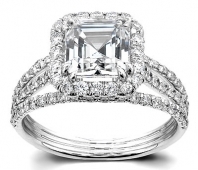 Though there are many styles of diamond rings, princess cut diamond rings are the best choice to consider if you are looking at one of our many dream engagement rings. You may not know that the Princess cut has a lower cost to manufacture, as it retains most of the weight of the rough stone – but strangely, Princess cut diamonds are often costly to buy because of the demand for them. 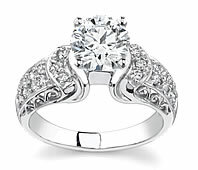 Nonetheless, Princess cut diamond rings are very popular. Though there are many types of Diamond Engagement rings available for one to choose from, the Princess cut Engagement Ring is unique and distinctly gorgeous and will enhance any setting. Men who want to ask a girl for her hand in marriage and want to present a unique engagement ring with a lot of radiance and sparkle, should consider Princess cut diamond engagement rings. There is a wide choice of Princess rings and you can select the ring which you and your bride like the best to make your engagement special and memorable. 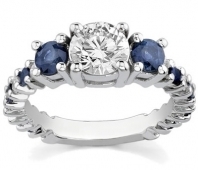 Contact a jewelry expert at Novori to assist you with your diamond and ring selection. We are available to assist you at 1-877-877-4141. Actually cutting the Princess cut in diamonds is one of the most challenging tasks that jewelers encounter and the technical name for this type of diamond is "square modified brilliant" diamond. The Princes cut diamonds have been in the market since 1970's but its popularity has still not abated. The extra faceting and clean lines that are typical of a Princess cut diamond ensure that the diamond appears thoroughly brilliant. If you are keen on getting an exotic Princess cut diamond ring, you can choose to set your ring in secure channel settings and bezel settings. To enhance the size of the diamond and fully bring out its radiance, you can set your ring in platinum surround or white gold. When buying the Princess cut diamond ring, check the diamond for cut, Color, Clarity and Carat so that you get an excellent diamond for your engagement ring. One of the key factors for a diamond to display its natural brilliance is the cut of the diamond. Diamond cuts are generally graded as "Exquisite", "Ideal", "Very Good" or "Good". Make sure you get a diamond with at least a good cut. Our diamond experts at Novori can help you select the perfect diamond. The color of a diamond is equally important and colorless diamonds are of higher value. Since colorless diamonds are very rare, they demand a premium price. However you shouldn't necessarily select a color D diamond. You can select a reasonably well-graded diamond color like E, F, G and get an excellent diamond with excellent value. Next, you should check the Clarity of the diamond. You should always choose a diamond that appears clean to the naked eye. At Novori, we inspect each diamond and will let you know if it is eye clean before you purchase it. We want you to have a perfect diamond. 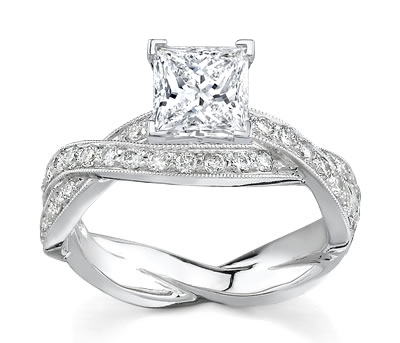 Princess Cut Engagement Rings are designed by skilled artisans with a traditional touch. Princess cut diamonds look fabulous when they are flanked by a diamond side stone on either side. 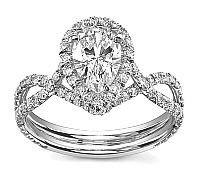 This type of an extraordinary engagement ring containing three beautiful sparkling diamonds can be breathtaking and at a very reasonable cost..
Women who like magnificent jewelry would probably choose a Princess cut diamond engagement ring with accent stones, while others most likely favor the solitaire. If you wish to buy a Princess cut diamond engagement ring, you can easily select one from Novori.com or call us toll free at 1-877-877-4141 for assistance.